Little Ross is an attractive and unspoiled island and its lighthouse, beautifully designed by the famous Stevenson family, is officially a 'lesser' light, far away from busy sea lanes, at the summit of this remote island. The island was unknown to most people until 1960 when a murder in the lighthouse buildings brought it widespread notoriety, to the grief and consternation of all who were involved. The author was at the island on the day of the murder, and was a witness in the High Court trial that followed. Over the subsequent 57 years, he has repeatedly been asked to tell his story but the 117 years of diligent tending of the light by numerous lighthouse keepers and their families has been largely forgotten. 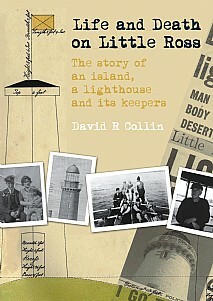 In Life and Death on Little Ross, the author has redressed the balance by telling the story of the island, its lighthouse and its people who lived and worked there including extracts from a detailed diary that has survived from WWI. Also featured are the island's earliest inhabitants, the ships and their crews that came to grief, the case made by concerned local people for a lighthouse to be erected, the political wrangling that frustrated its approval for many years, the lighthouse design, and the eventual construction of the buildings. The story did not end with the murder. The process of automation began immediately after the event and the work of conversion, repair and maintenance, including first-hand accounts by some of the tradesmen is provided. The story of the restoration and conversion of the lighthouse keepers’ derelict cottages is one of courage, patience, stamina, skill and resourcefulness which should inspire all of the many people that love wild, beautiful and unspoiled places like Little Ross Island and care about the future of buildings of distinction. This will be of especial appeal to all lighthouse enthusiasts, everyone with an interest in the natural world and social and local history.